No one wakes up in the morning prepared for an auto-accident. Take a look so you know what to do in a car accident. 1) Stop your car. Even if you think that the accident was minor, you need to stop to make sure that anyone involved and/or their car is okay. 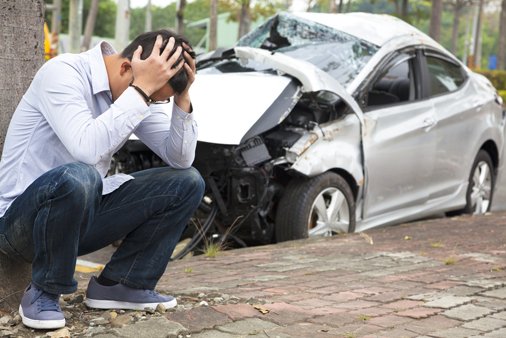 Leaving the scene of an accident, even a minor one, can have serious consequences. 2) If there is any damage to a vehicle or anyone involved, call 911 or ask someone to call 911 to report the accident and request help, either the police and/or an ambulance. If you are involved in a hit and run, you will likely need the police report to send to your insurance company. 3) Do not leave the scene or move your vehicle until police/ambulance have arrived. If for some urgent reason you have to move your vehicle, take pictures of the scene with your smart phone before moving the vehicles. As the saying goes, a picture is worth a thousand words. Get names of any witnesses and exchange driver information with the other driver (name, address, insurance company). 4) When the police and/or medical assistance arrive, say exactly what happened. If you do not know what happened, tell the officer that you are unsure. Do not guess or speculate. Even if you think that you’ll eventually be okay, tell the officers and/or medics if you are in any amount of pain or discomfort. If there are witnesses around, make sure that they say exactly what happened. 5) You should go to the emergency room if you are injured. Even if you feel that you will likely be okay, you should get checked out by a physician so they can do a full evaluation to rule out any injuries. 6) Take pictures and keep your receipts. Once you are released from the hospital, you may be prescribed some medicine to help with the pain. If you fill the prescription, be sure to keep your receipt. If you are in a brace or cast, take pictures. In addition, over the next couple of days, bruising may develop. Be sure to take pictures of the bruising. 7) Contact your insurance company and report the accident. Even if the other driver’s insurance is at-fault, you should still notify your car insurance. You may have med-pay, which I’ve previously discussed in prior posts. 8) Contact an attorney. Nowadays, a personal injury attorney will provide a free consultation with no obligation. An experienced personal injury attorney will be able to walk you through the next steps. I tell my clients that while this may be their first car accident, its not mine. As the saying goes, knowing is half the battle. Please give me a call if you have any questions or been injured a motor vehicle accident.